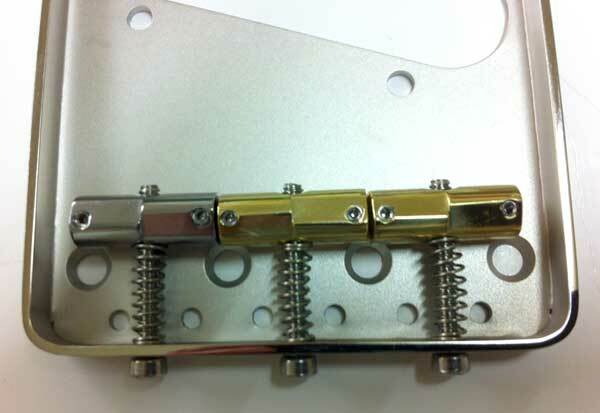 I’ve been asked many times why I use different metals for my bridge saddles on guitars. When I am building a guitar, one of the main attributes I want to have is an even sound. On a T-style guitar, this goal is a constant battle for me, and I’ve found that by combining stainless steel and brass bridge saddles, I can accomplish the balance my customers want. The journey to this decision started about 15 years ago. I was talking with Charlie McVay of McVay Benders about the acoustic properties of different metals. He told me about the aircraft aluminum he used in his benders, so I had him make me a set of compensated aircraft aluminum saddles, which were not available commercially at that time. I really liked them on the bass strings because it seemed to take some of the tubbiness out of the low end. For a few years, I used the aircraft aluminum saddles on the low E and A and used brass on the others. The sound improved, but I felt like I lost some of the punch on the low strings. Eventually, venders started offering saddles made of a variety of metals. After a lot of experimentation, I settled on stainless steel saddles for the low strings and brass saddles on the others. I feel the stainless steel retains the punch while keeping the note clear and tight. The brass saddles on the other strings retain the smoothness that I like. I have been using this combination for years and really like the result. When you set your amp where the high end is smooth enough, you wish the bass strings had a bit more snap. Or, if you have enough snap on the low end, the high end is too bitey. Turning the tone down helps, but it doesn’t quite do it. If you’re nodding your head in agreement right now, the stainless steel and brass saddle combination may be your solution. This entry was posted in Story Behind the Guitar and tagged strings, T-Style. Bookmark the permalink.